Dwarika Hotel, P.O.Box-459, Battisputali Kathmandu, Nepal. Guests enjoy a tradition of casual elegance; comfort assured by an uncommon attention to detail and personal service. 74 Deluxe Rooms and Suites. Each of the rooms has its own character and individuality. There are 16th century windows in many, while there are private courtyards attached to others. Buddhist symbols on hand printed curtains and bed spreads are used with traditional fabrics and accessories. Spacious and luxurious, Dawarika Hotel Kathmandu suites and rooms have been individually designed with imagination and taste. Each one different and unique: you will find all the amenities of a luxury hotel; but perhaps what you will appreciate more is the elegant comfort of your room; handsomely appointed with handmade fabrics and furniture custom designed from traditional patterns. Dwarika's Hotel, winner of the PATA Heritage Award now offers you not only the secrets of Nepalese art, architecture and hospitality but KRISHNARPAN. A special Nepalese restaurant in an historic and beautiful setting. For the best recipes of Nepal, the finest meat, vegetables, aromatic spices, purified oils and saffron are selected by the chef every day to create for you an exotic meal from 6 to 20 courses. KRISHNARPAN invites you to capture a moment of history of a rich and ancient culture, to dine at tables designed with centuries old lattice woodwork, served on antique traditional plates and glasses by charming hosts and hostesses dressed in different ethnic wea. Look no further than Dwarika's for a very special venue for your conference, seminar or workshop. As well as a beautiful setting of authentic Nepali architecture, wood carvings and terracotta brickwork, Dwarika's provides modern conference facilities. 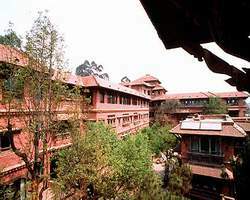 Dawarika Hotel Kathmandu Lohn Hiti conference hall can accommodate 100 people theatre style and up to 50 people in hollow-block-seating style. All your audio visual, security, decoration and stationery requirements can be met. Catering is handled in-house with a wide range of snacks, full meals and special menus available. Optional programme such as cultural shows and spouse tours can easily be arranged. Whether your meeting is non-residential or residential Dawarika Hotel Kathmandu will welcome you at Dwarika's.BUSINESS CENTER: Dwarika's Business Center has modern facilities and up to-date equipment. The lore of Nepalese food is entwined with taboos of religion, superstition and caste. This has produced a satisfying, sustaining and healthy cuisine. after a hot days sight seeing, dip into cool clear water! A dynamic massage which balances the energy in the body through stimulating pressure points along energy lines and passive yogic stretches. A massage utilizing traditional herbal oils to promote the body's natural healing process. A relaxing deep tissue oil massage, which loosens and softens muscles and joints and relieves stress and fatigue. Given with a soothing blend of herbal oils, using acupuncture points and spinal cord relaxation to stimulate breath and energetic circulation.